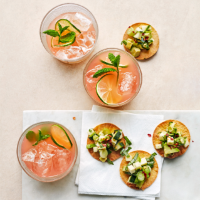 These zingy cocktails with gin, grapefruit and lime are delicious on their own, but go so well with these crisp tostadas with their fresh and light topping. 1. Preheat the oven to 180˚C, gas mark 4. For the tostadas, mix the lime juice, maple syrup, 1 tsp oil and a pinch of salt in a bowl. Toss in the courgette; set aside. Use a 7cm cookie cutter to make 16 circles from the tortillas. Put on a parchment- lined baking sheet and brush with the remaining 2 tsp oil. 2. Bake the tostadas for 5-7 minutes until just turning golden. Arrange on a serving plate. Toss the basil, salad onion and avocado through the courgette. Pile the mixture onto the tostadas and top with the chilli flakes. 3. For the gin paloma cocktails, put the sugar and 2 tbsp water in a small saucepan. Warm until the sugar has dissolved; simmer for 1 minute. Squeeze 300ml juice from the pink grapefruits, stir into the sugar syrup, then sieve into a jug to remove any pips and flesh. Fill 4 tumblers with ice and add a measure of gin to each. Divide the grapefruit juice syrup between them; squeeze the juice of ½ lime into each. Top up with soda water and garnish each with the sliced lime and a mint sprig. Serve immediately with the tostadas. Crisp up the leftover tortilla pieces in the oven with the circles. Cool to room temperature then transfer to an airtight container for up to 1 month and use to sprinkle over soups or salads.